Using our official WordPress Plugin, you can integrate all of your inventory data (in near real-time) directly into your website. This plugin will automatically sync your SalesBinder data into WordPress and create a custom post type for easy integration with any Theme. As an example of how to display your newly synchronized inventory list using this plugin, have a look at the following example below. 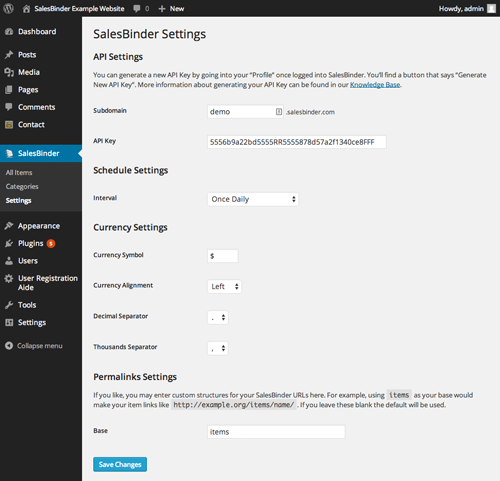 This shows you how you could modify the basic "twentytwelve" WordPress Theme to display your synchronized inventory list. Save this new file in the root of your theme's folder (ie. /wp-content/themes/YourThemeName/). Modify the "index.php" file to check the "Post Type"
This is a snippet to show how you can modify the index.php file to check the Post Type and use the new file we created above. Do the same thing for "single.php" and "archive.php"
These are also snippets of how you could modify the other files.